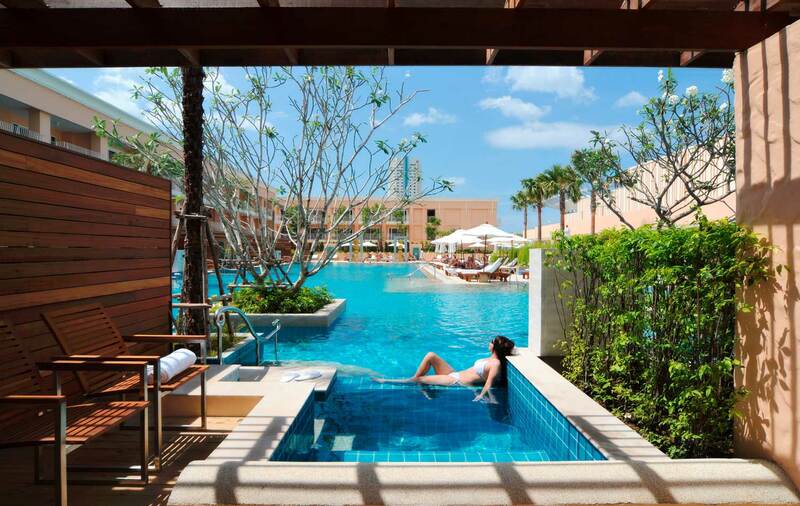 Officially opened back in July of this year, the Millennium Resort Patong Phuket is one of the latest launches from one of the fastest growing hospitality groups in Asia, and it is obvious to see why this is when one experiences the top-notch design that the resort is made up of. With Thailand’s tourist appeal fully restored, interest has once again returned to the beautiful collection of South-eastern Asia islands. The Millennium Resort Patong Phuket is a concrete indication of this, and when the hotel soft-opened last year it was actually one of the first international hotels to launch since 2004. Nevertheless, that doesn’t make the hotel any less spectacular, with the newly-built 421-room property emerging in a sea of well-designed splendour. The resort incorporates Thai elements in its design, but there is also the trademark contemporariness that is characteristic of the hotel brand. For example, while the poolside private-Jacuzzi rooms feature Thai-inspired decorations on the outside patio, there is also a selection of mod-cons and stylish furnishings within. The hotel consists of two wings – with each building featuring its own open-atrium lobby, and each with its own picturesque rooftop swimming pool. In addition, there is a well-equipped gym centre and spa; two bars and two restaurants; plus 14 meeting rooms. Being one of the only hotels that comes close to 5-star in this area, the Millennium Resort Patong Phuket also boasts a prime location on theRat-Uthit Roadat the intersection ofBangla Streetnear the popular Patong Beach. This makes the resort part of the new landmark that is the mega Phuket Jungceylon shopping mall, and together these developments are rejuvenating Patong Beach and bringing new life toThailand.